Having a pet is like having a family member. The care, love and the affection towards the pet is unmatched. Just like a child, your pet needs constant care and nursing to stay in a healthy shape. And if you’re traveling, it becomes all the more important to ensure that your pet’s health and safety is properly taken care of. Making your pet a part of your family celebration during holidays can be fun and safe with the following simple safety tips. You would never want an upset stomach for your pet during holiday’s right? Ensure that you don’t give him your table leftovers at all. Rich and fatty food that we humans eat might not be easily digestible for your pet. You obviously know which all food we eat are okay for your pet but avoid high on fat food and give everything in moderation. Ensure that your pet’s routine is not disturbed to a large extent. Maintaining a consistent routine for your pet as much as possible will help him stay in his best of health. Most of the pets are delicate in nature and do not easily adapt to any major change in their routine. Make sure you do not forget your open bottles of wine, drinks and liquor anywhere around your pet. These liquids if consumed can make your pet seriously ill and can even be life threatening for them. Same goes for your curious little kids in the house who out of their love would like to feed the pet with small portions untimely. Giving instructions and warning them regarding the health hazards as a result of such actions would be a good idea. In case if your holiday decorations, there’s a lot to be taken care of with respect to your pet. Ensure that all the electrical cords and wirings are properly hidden and out of reach of your pet to avoid any mishap. You never know what can lead your curious pet to chew them and get hurt. There is a lot to be taken care of while installing those beautiful holiday plants like lilies, poly, mistletoe etc. can be poisonous for your pet, especially if you have a cat or a dog. If you are taking a holiday around festive occasions like Christmas, ensure your pet is out of reach from your Christmas tree. 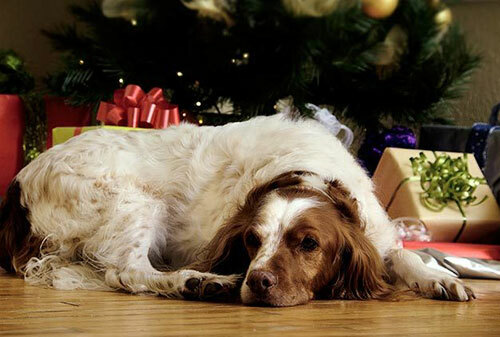 It can cause serious intestinal problems if your pet chews any branch or tinsel out of your Christmas tree. It is just as important to be careful about your pet as you will be for the comfort of any of your other family member. If you are travelling keep your pet updated with the vaccinations and necessary medications. Just a little care for your sweet little creature and you will have your best friend hale and hearty, ready to enjoy holidays with you.